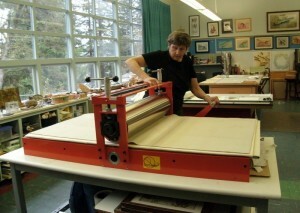 My beloved 30 x 60 Takach etching Press goes to one of my students in Corvallis- farewell Big Orange! It has long been my passion to share what I know and love about nature printing, gyotaku, and the sea. Six and a half years ago in 2012 I relocated from Sarasota,Florida and set up a studio in an old mill town of Toledo, Oregon. The goal of this studio was teaching about nature printing; both gyotaku- fish printing, plant printing, and the making of paper. For the last six years I have taught a variety of workshops here, but find myself pining for tropical weather. In March I am officially closing the studio, and soon after am relocating to a small town in central Mexico. I hope that I inspired people to enjoy nature printing as I have, and to take inspiration from the natural wealth offered by oceans, forests, rivers, marshes, fields. The calendar on the right lists my upcoming and final Sea Fern Studio workshop schedule. Who knows what Mexico will offer??? TI am in love with ceph’s- those intelligent creatures, and often teach gyotaku with their soft bodies. “Squid Row” celebrating the world of Cephalopads! It shows the process of making gyotaku from the fresh fish to the finished! In 2001 Oregon Public Broadcasting aired a segment of Oregon Field Guide about Gyotaku from my studio in Bend, Oregon. It shows the process of making gyotaku from the fresh fish to the finished!